Type and Characteristics: Topsail schooner-rigged steam cutter (above), built by Hall Brothers, San Francisco, CA, completed 10 November 1885, 300 tons displacement, 175ft long x 26ft beam x 12ft 6in draft, compound-expansion 400 hp steam engine, one propeller, armed with 3-6pdr guns, crew of 40. Log Period and Areas of Service: 1885-1912, Pacific and Alaskan waters. 10 November 1885 - Rebuild completed by Hall Brothers of San Francisco at a cost of $74,000. Longer and heavier, she retained the boiler and engine of the original Rush. 5 December 1885 - Ordered to Bering Sea to search for crew of whaling bark Amethyst. February 1886 - Returned without success. Assigned to San Francisco station and patrolled Californian coasts. 28 May 1887 - Cruised Seal Islands until September unless relieved by USRC Bear. Returned on 8 October. 3 July to 2 October 1888 - Cruised in Alaskan waters. At these times, she carried "floating federal district courts", searched for survivors of wrecked ships, assisted vessels in distress, enforced fisheries laws, participated in local celebrations, transported dignitaries (local, federal, and international) and presumably much more. 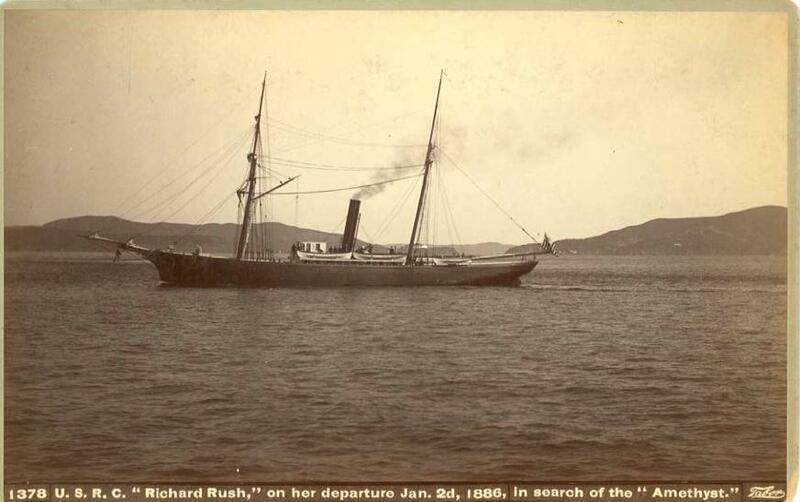 1 June to 14 October 1889 - Cruised Alaskan water, visiting Unalga and Unalaska. June to October 1890 - Alaska and Seal Islands. May to September, October to 15 December 1891 - Two voyages to Alaska. May to Fall 1892 - One voyage to Alaska. 21 March 1893 - Sailed for Honolulu. Arrived back in San Diego on 18 April. Visited Seattle and Port Townsend in May. 23 July 1894 - Sailed for Bering Sea, returning with Assistant Secretary Hamlin. 5 May to 6 October 1895 - Alaskan cruise. 28 April to 6 October 1896 - Alaskan cruise. 26 February 1897 - Ordered to Farallon Islands to protect sea lions against hunting expeditions. On 5 May, sailed for Bering Sea to work with a Professor Jordan (believed to be Dr D S Jordan, a seal expert). Returned from St. Paul Island on 15 August and arrived San Francisco on 30 September. 9 April 1898 - Transferred to US Navy control during Spanish-American War, but did not see any action. Returned to Treasury Department on 15 August. 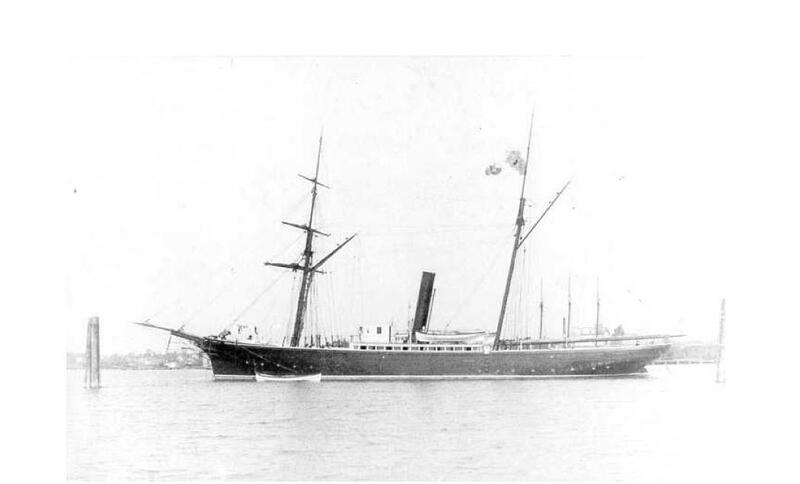 13 June 1899 - Sailed from Seattle, arriving at St. Michaels on 14 July with the Nunivak in tow. Arrived back in San Francisco on 28 September. 18 May 1900 - Sailed from Seattle, arrived Dutch Harbor on 4 June, returned to Port Townsend on 15 October. 23 May 1901 - Departed Port Townsend to assist the vessel Grant (presumably USRC Grant). On 4 July celebrated Independence Day at Sitka (see image below). May 1902 - Sailed for Sitka, carrying a Mr Coyle to parts of Alaska. Returned to Seattle on 29 October. 9 July 1903 - Sailed to St. Michaels, Alaska, to pick up Judge Wickersham and officers, and take them to various parts of Alaska to hold court. On 27 November headed to search for survivors from the vessel Discovery, wrecked near Yakutat. None were found. 4 July 1904 - Sailed for Sitka and other destinations with Judge William A Day and his court party. Returned on 26 July when her Alaskan headquarters was changed from Sitka to Juneau. Underwent refit in August (image above). Sailed for Nome, arriving 25 August, and then visited Dutch Harbor, Sitka and Juneau, before returning to Seattle on 22 October. 26 May 1905 - Captain Francis Tuttle took command. Took part in 4 July celebrations at Santa Cruz, California. On 6 November, ordered to sail for Sitka and cruise the inland waters of SE Alaska, calling in at Juneau as necessary. There on 27 December when detained by heavy snow storms. 12 February 1906 - Reached Seward in search for vessel Dora. In March, carried Deputy Collector of Internal Revenue and Deputy US Marshals to Valdez, Alaska, and in April, left Sitka for Port Townsend. A month later, she sailed for Juneau and on 19 June left for the Yakutat cannery cruise. On 29 August, ordered to Seattle to pick up Mr. Hanihara, Second Secretary of the Japanese Embassy in Washington, DC, and carry him to the Pribilof Islands and other destinations. In September, she carried staff of the Surveyor General's Office and their families, together with records and other government property from Sitka to Juneau. Then on 21 September, four engineers from the American Smelting & Refining Company who had been wrecked on the vessel Oregon were taken from Valdez to Juneau. January 1907 - Sailed to provide relief to the Yakataga people, and in April ordered to return to Sitka. Arrived at Sitka on 24 May and by the 27th was cruising the Fairweather Ground on seal protection duties. By then, she had been ordered to be at Juneau on 1 June to take Agent Cobb on a cannery cruise and after leaving him at St. Michael's, head for Nome, pick up the Governor of Alaska for an official trip to southern and southeastern Alaska. Arrived at Moran Shipyard, Seattle on 18 June to have new crank pin fitted and on the 30th, sailed for Dutch Harbor. Arrived Unalaska on 14 August, and carried out Seal Island patrol in place of USRC Manning. 6 February 1908 - Back in Seattle. On 21 May, sailed for Alaska, following coastline to Unalaska, and carried out Bering Sea Patrol until 11 October. 8 May 1909 to 9 February 1910 - Alaskan cruise, including Juneau, Kodiak, Valdez and Unalaska. 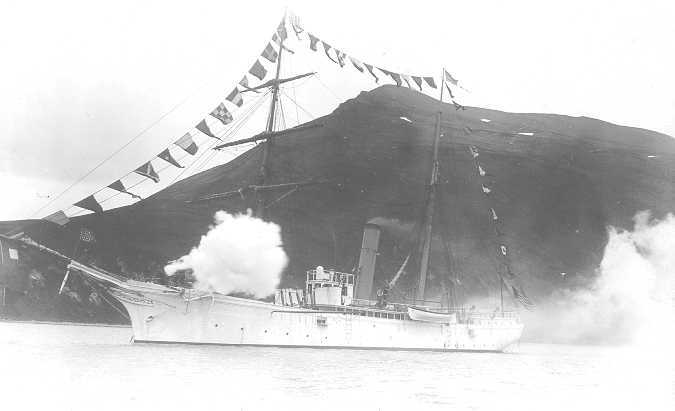 5 June 1911 - Sailed from Unalaska. Ordered to return to Unalaska towards the end of August to carry the Governor of Alaska to Juneau and other destinations on passage. Returned to Port Townsend on 3 November. 1 January 1912 - Sailed for the Juneau Station and on 1 April continued on a seal protection patrol off the Alaskan coast. Returned to Port Townsend on 25 May, and on 20 June, detached from the Northern Division. She was ordered to San Francisco to relieve the USRC Snohomish. In August, patrolled the Lipton Cup Sailing Races at San Diego, and on 14 September 14th, ordered to Port Townsend. 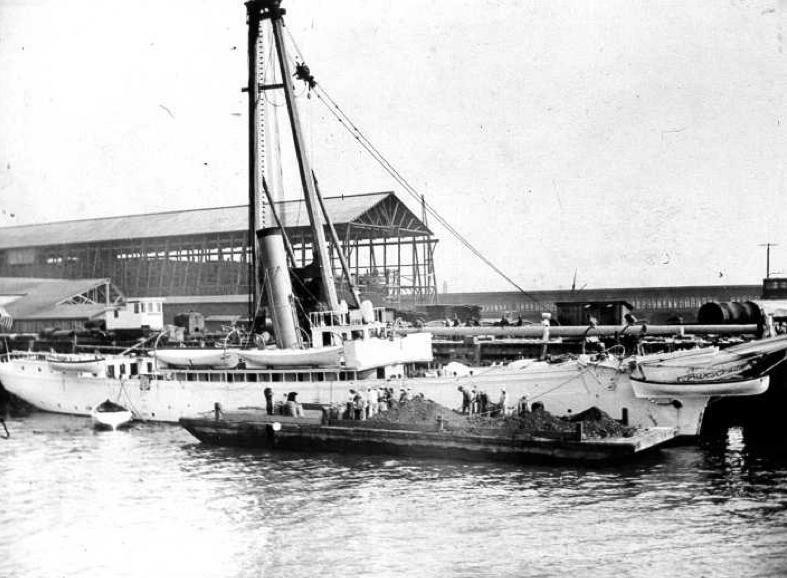 Fate: Decommissioned 30 September 1912 at Port Townsend, and on 22 January 1913, sold to the Alaska Junk Company for $8.500.00. 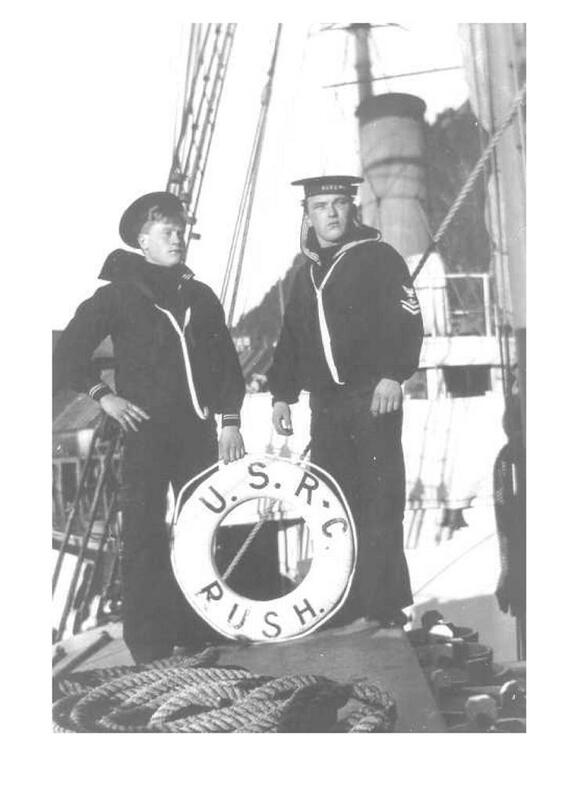 USRC Rush (II) refitting at an unidentified shipyard, photographer unknown.